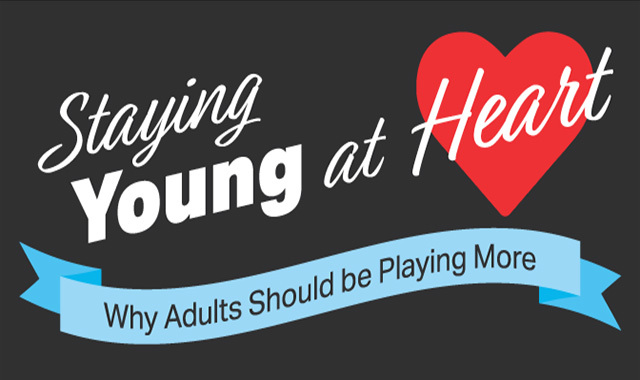 Staying Young at Heart: Why Adults Should be Playing More #infographic ~ Visualistan '+g+"
When we think of the word “play”, we think of children and their innate ability to engage in playful activities, the benefits it has on their health, and how much fun children have while playing. Unfortunately for us adults, play is often dismissed in everyday life and is viewed as immature, unproductive, and unwelcome. At some point, during our aging, we just stopped playing. In our busy, modern, and technology filled world we have been focusing too much on work, family, and structured routines and we have forgotten how to play. There needs to be a shift from thinking that play is an aspect of childhood, to the realization that play is an important part of adult life. This article will discuss the benefits of playing in adulthood, and will provide you with ways you can bring back play, novelty, and fun into your everyday life.